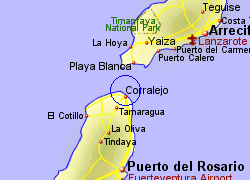 Map of the Corralejo Ferry Port area. The small port at Corralejo is located on the northern tip of Fuerteventura, where there is approximately 12km between the island and neighbouring Lanzarote. 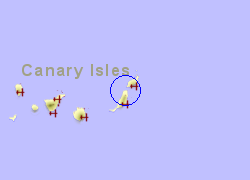 The port is used primarily for communication between the two Canary Islands. Corralejo itself was originally not much more than a fishing village but has now grown into the largest resort on the island. 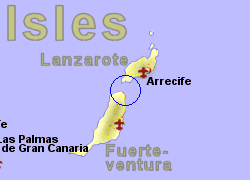 The FV-1 road connects Corralejo to the capital Puerto del Rosario, the 32 Km journey taking just over half an hour by car. A bus service runs between Corralejo and Puerto del Rosario every 30 minutes for most of the day (every hour on Sundays). Operated by Armas with 7 crossings per week, crossing time 25mins. Also operated by Fred Olsen with up to 7 crossings per week, crossing time 25mins.